How much coverage in the UK media do you think this would receive? Would we see articles about Muslims trying to bring sharia law to the streets of London? Would commentators fall over themselves to decry Islam as a religion of extremism and intolerance? Would our media and politicians call on Muslim leaders to denounce such primitive practices? From long experience, we all know the answer. So how to explain the near-silence about exactly this happening last week in the London district of Hackney, except that religious Jews rather than Muslims were the party responsible. The Shomrim organisation put up the signs in preparation for the Torah procession in Stamford Hill. The posters were removed after local residents complained. But as the Redress website notes, the official response has been decidedly muted. An online search finds this story apparently of interest – and then only marginally – to local London media, plus one low-key story in the national Independent newspaper. And a police spokesman merely expresses concern about a “potential misinterpretation” of the signs, without explaining in what possible way they might be misinterpreted. 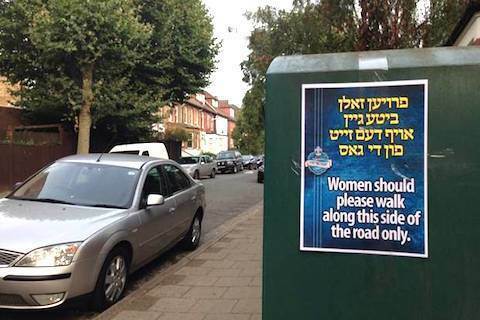 In other words, as long as the Jewish misogynists confine their hateful practice to Hebrew-reading Jewish women, and do so quickly before anyone has had time to ponder why this is happening on the streets of a British city, everything would be fine. It is worth bearing this story in mind next time you read an Islam scare story in the western media. What standards are used in assessing the Muslim community and how consistently are they being applied to other religious communities? And if there is an inconsistency, what motivates it? Why are news editors regularly playing up a Muslim threat, but playing down a Jewish or Christian or Hindi or Sikh threat?